Chaos! It’s a word you could use to characterize what US President Donald Trump has triggered across the world by blending the abstract with the arbitrary. Chaos! It’s a word you could use to characterize what US President Donald Trump has triggered across the world by blending the abstract with the arbitrary. It is believed that those inside the administration seem to know as little of the when, where, why and what of Trump’s actions as those outside. An apocryphal story doing the rounds in Washington suggests the US and China had almost closed a deal to avert a trade war. And then Trump fired the tariff salvo. India is in the crosshairs, too. Commerce Minister Suresh Prabhu is set to meet US Trade Representative Robert Lighthizer next week in Washington—the quip among negotiators is whether a Prabhu-Lighthizer pact can be binding on Trumponomics. The headline optics is about zero duties for Harley Davidson bikes and the curbs on spouses of IT professionals in the US on H1B visas. The battle is bigger and more complex. On June 19, the USTR is convening a public hearing to review India’s eligibility for GSP or generalized system of preference that enables market access at low tariffs, specifically for dairy products, medicines, and over 3,000 other products. The action has been prompted by representations from the politically powerful National Milk Producers Federation and the US Dairy Export Council, and from the Advanced Medical Technology Association on pricing and access. India and the US are locked in combat at the WTO. The US has brought seven cases against India. These include patent protection for pharma and chemical products, quantitative restrictions on imports of agri, textile and industrial products, measures impacting investment in the auto sector, additional duties on imports from the US, conditions imposed on import of agri products, solar cells, solar modules, and export-related issues. 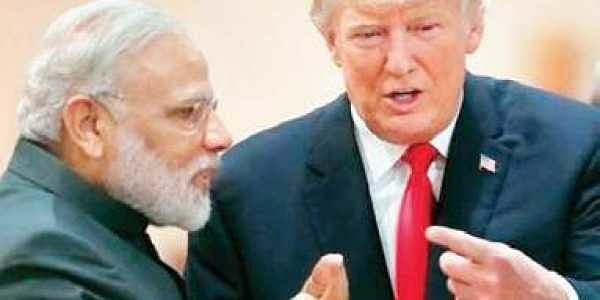 India has filed 11 cases against the US at the WTO. These include measures affecting import of women's woollen coats, shirts and blouses, import prohibitions on shrimp products, anti-dumping and countervailing measures on steel plates, rules of origin for textiles and apparels, measures on hot-rolled carbon steel, measures concerning non-immigrant visas, solar panels and steel and aluminium products. Behind the fusillade of name-calling, accusations and braggadocio there is a political message. The focal point of all rhetoric is to convince those who voted for him that he is on the job. The denial of climate change, the revival of coal, the targeting of EU and Canada on agricultural products, and of China and India on market access and IPR violations are par for the course. There is also a method. Trump is deploying existing provisions in US laws to influence outcomes on trade deals and even investments. On May 23, 2018, the Secretary of Commerce, under Section 232 of the Trade Expansion Act of 1962, initiated investigations to determine the effect of imports on national security and possible weakening of the national economy. The probe is also looking at domestic production of automobiles and auto parts. One intriguing issue being examined is “Whether and, if so, how the analysis of the above factors changes when US production by majority US-owned firms is considered separately from US production by majority foreign-owned firms.” The question about this distinction merits the attention of the government and Indian investors. At another level there is continuation of probes and documentation. India has been placed on the “priority watch list” for successive years—in the 2015, 2016, 2017 and the 2018 Special 301 Report put out by the USTR— and finds mention on multiple issues at multiple places. And there are issues ranging from IPR protection to patents to counterfeit products. For instance, the 2018 Report says: “The United States notes its particular concern with the proliferation of counterfeit pharmaceuticals that are manufactured, sold, and distributed in numerous trading partners, including China, India, Indonesia, and Thailand”. India has argued and recorded rebuttals about duties being below bound rates as per WTO agreements. But Trump campaigned and came to power with a firm belief that all trade agreements are ranged against US interests. This is validated by his political rejection of Nafta or the Trans-Pacific Partnership. His disdain for multilateral institutions like WTO is well-known, as is his scepticism about international rules-based systems. The Trumponomics of trade is based on the precept of size matters—basically leverage of market size to the tune of America First. The author of the Art of the Deal invests faith in his own thesis. Trumponomics is aligned to Trump’s politics. The cause of his political constituency matters and there is little room for doubt, for instance if higher steel tariffs could result in job losses in user industries. Or that the history of trade wars shows there are no winners. In the age of autonomous technology he is frequently setting his own GPS or geo political strategy, and at odds with his own administration. The spectre of trade wars is looming large. The trade-off with Trumponomics is a complex cocktail of geopolitics and economics. India needs to look for out-of-the-box tactics and a strategy ranging from political leverage of market size and access to usage of geopolitical countervailing measures. Carl Jung once said: “In all chaos there is a cosmos, in all disorder a secret order”. Deciphering it is the challenge.